Metadata cleanup using GUI tools. This be done in two ways that are using Active directory users and computers and Active directory sites and services. On Start menu, point to Administrative Tools-> Active Directory Users and Computers. 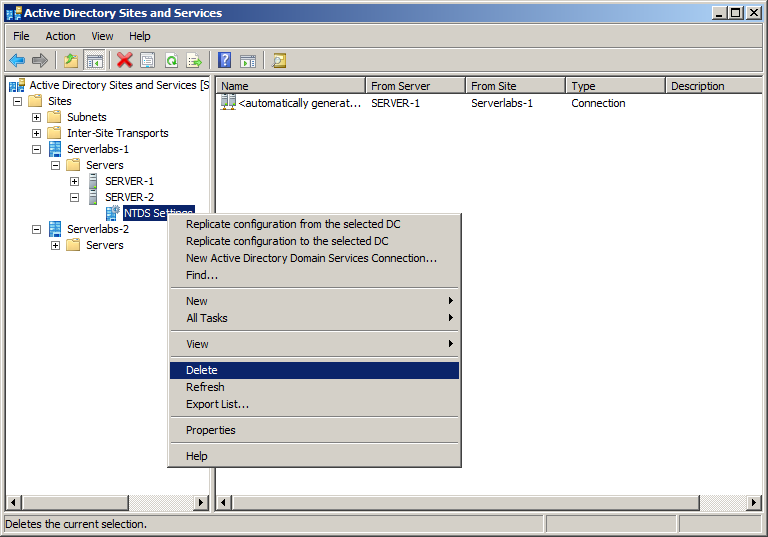 If you have identified replication partners in preparation for this procedure and if you are not connected to a replication partner of the removed domain controller whose metadata you are cleaning up, right-click Active Directory Users and Computers or you <Domain Name> and then click Change Domain Controller. Click the name of the domain controller from which you want to remove the metadata, and then click OK.
Now Expand the domain of the domain controller that was forcibly removed, and then click Domain Controllers. In the details pane, right-click the computer object of the domain controller whose metadata you want to clean up, and then click Delete. Now you will have an Active Directory Domain Services dialog box which will ask for confirmation. Click Yes to confirm the computer object deletion. In the Deleting Domain Controller dialog box select the check box This Domain Controller is permanently offline and can no longer be demoted using the Active Directory Domain Services Installation Wizard (DCPROMO), and then click Delete. If the domain controller is a global catalog server, in the Delete Domain Controller dialog box click Yes to continue with the deletion. If the domain controller currently holds one or more operations master roles, click OK to move the role or roles to the domain controller that is shown. Expand the site of the domain controller that was forcibly removed, expand Servers, expand the name of the domain controller that was forcefully removed and right-click the NTDS Settings object, and then select Delete. In the Active Directory Domain Services dialog box click Yes to confirm the NTDS Settings deletion. In the Deleting Domain Controller dialog box tick the check box This Domain Controller is permanently offline and can no longer be demoted using the Active Directory Domain Services Installation Wizard (DCPROMO) and then click Delete. Right-click the domain controller that was forcibly removed and then click Delete. In the Active Directory Domain Services dialog box, click Yes to confirm the domain controller deletion. 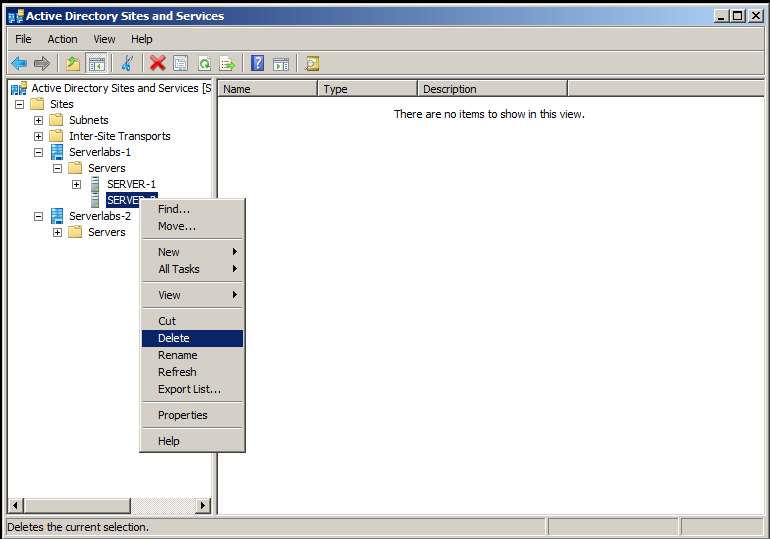 Removes the NTDSA or NTDS Setting subject. Removes inbound AD connection objects that existing destination DCs use to replicate from the source DC being deleted . Removes the computer account . Tries to seize flexible single operations master roles (also known as flexible single master operations or FSMO) held by the DC that are being removed . Caution: The administrator must also make sure that replication has occurred since the demotion before manually removing the NTDS Settings object for any server. 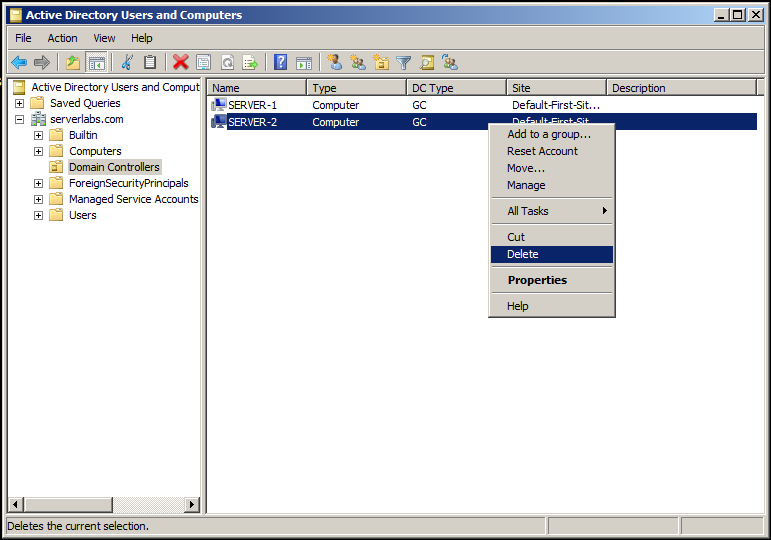 Using the Ntdsutil utility incorrectly may result in partial or complete loss of Active Directory functionality. Note: Make sure that you have logged on as a user who is an Enterprise Admin. Open command prompt, Start->Command prompt->right click and select 'Run as administrator'. 'Metadata cleanup' and press ENTER. At the Metadata Cleanup prompt type connections and press ENTER. where server-1 is the name of an available domain controller which holds Operations Masters Roles. At the Server Connections prompt, type quit and press ENTER. Now you will be back to metadata cleanup prompt, type select operation target and press ENTER. At the Selected Operations Target prompt, type list domains and press ENTER. This will list all the domains in the forest and each domains listed with a number associated to each. As you can see I have only one domain in my forest that is Serverlabs and its ID is 0. At the Select Operations Target prompt, type select domain 0, and press ENTER. Where as the number “0” is the domain that contains the failed domain controller(server) . At the Select Operations Target prompt, type list sites and press ENTER. This lists all the sites in the forest and those are listed with a number assigned to each. At the Select Operations Target prompt, type select site 0, where number “0” is the site containing the failed domain controller, and press ENTER. At the Select Operations Target prompt, type list servers in site and press ENTER. At the Select Operations Target prompt, type select server 1, where number “1” is the failed domain controller, and press ENTER. At the Select Operations Target prompt, type quit and press ENTER. Please note that by the above steps we have connected to the domain controller that is failed. In order to start the metadata cleanup At the Metadata Cleanup prompt, type remove selected server and press ENTER. You will have server remove confirmation dialog box, Click Yes to continue. Now the metadata cleanup will continue and you will have the below result after the successful cleanup. Type quit twice to exit the command prompt. You can refer the below link in order to achieve the script that will help you to perform metadata cleanup.